SHIPPING UPDATE April 3rd: Since Passover is right around the corner, we are now mailing our orders with expedited shipping only. Looking to add a touch of decor to your Seder table this year? Our classic set is the perfect solution. This table decoration bundle will have your guests and kids enjoying a personal touch to the Seder story, will give everyone a Passover night to remember. 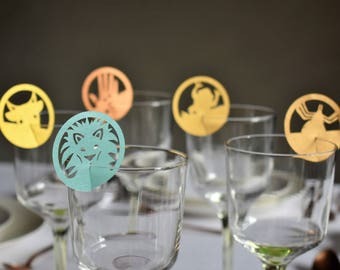 - Chag Sameach or Passover place cards. - 10 Plagues wine glass decoration. + Sold in a set 10 or 20. + Made with premium metallic card stock in white and premium metallic paper in gold, copper, teal, bronze, and super gold. + Dimensions: Place cards: 2.5*3.1 inches,10 Plagues decoration: 2 inches in diameter. 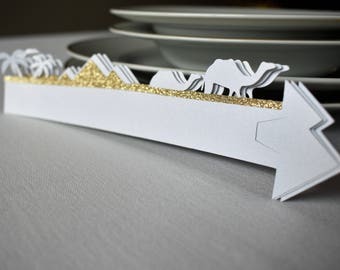 + We send the place cards flat as it is easier to write on. For assembly fold in half. + Please note that colors may appear slightly different in person than what you have viewed on your screen. Different devices will show colors differently. + We use Canada post regular ground shipping for shipping our products. + Regular ground shipping to the US takes between 5 business days (for most cities nationwide) to 8 business days (to more remote locations). + If you would like a tracking number to your parcel, please select that option in the shipping section at the checkout. + Expedited shipping takes 2-3 days and is also available in the shipping section at the checkout. 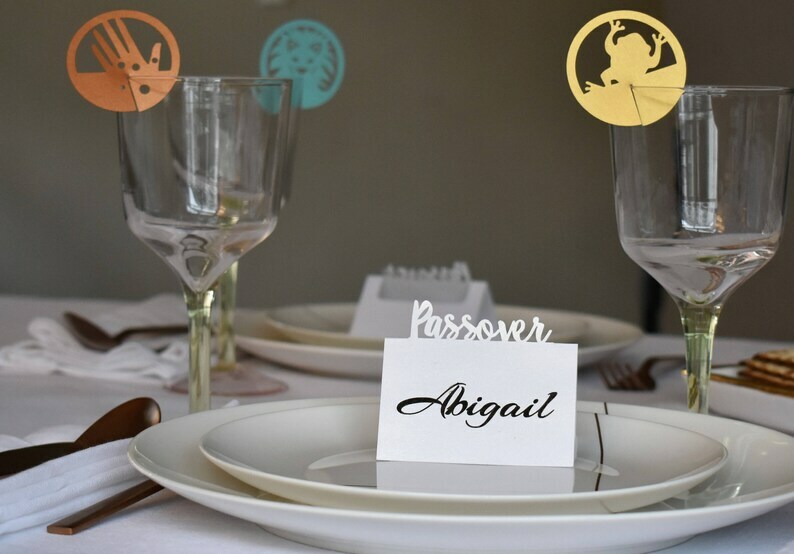 These place cards and plague decorations made our Passover table look extra special. Thank you! Exactly as pictured. Very festive! I am giving this item a 4-star review because of the craftsmanship and the nature of the product - however, I did see a few issues with it. The string included to thread through the letters and symbols is very fragile, and the gold strand pulls away very easily when trying to thread (although it is easier if done with a needle). I would like to see some hemp or heavier twine used in a product like this next time, because I am not sure I will get more than one use out of this string that was included. Also, it would be helpful for those who are unfamiliar with the plagues/Hebrew language if a tiny instruction booklet was included to let people know in what order they are to be strung.